Donald Trump’s choice of Kansas Secretary of State Kris Kobach to co-chair his new commission on “election integrity” is like asking Vito Corleone to crack down on police corruption or Vladimir Putin to defend human rights. It’s worse than a fox guarding the henhouse. Maybe that’s an exaggeration. But it’s no exaggeration to say Kobach, a hardline anti-immigrant operative who seeks out ways to undermine voting rights, may have done more to hand the 2016 elections to Donald Trump and the Republicans in Congress than Vladimir Putin and James Comey combined. So there’s more than a whiff of payback in the air. And with Kobach now empowered to scrutinize the non-issue of “voter fraud” nationwide, the Republicans are gearing up to steal the 2018 and 2020 elections, unless we stop them. Kobach is the driving force behind the Interstate Voter Registration Crosscheck Program, or “Operation Crosscheck” – a nationwide, behind-the-scenes Republican effort which purged at least 1.1 million, mostly minority, voters from the voting rolls in 2016, often in swing states. Before a single vote was cast, the election was fixed by GOP and Trump operatives. Starting in 2013—just as the Supreme Court gutted the Voting Rights Act—a coterie of Trump operatives, under the direction of Kris Kobach, Kansas Secretary of State [and a key member of the Trump transition team] created a system to purge 1.1 million Americans of color from the voter rolls of GOP-controlled states. Kobach’s Crosscheck list contains the names of 7.2 million people with the same first and last names who are registered to vote in more than one state. For example, if you have a common name like James Brown, or Jose Hernandez, and that name appears on the voter rolls in both Michigan and Wisconsin, your name could be purged from voter rolls in both states. The Harvard and Yale-trained Kobach got his start in exclusion politics after 9/11, when George Bush’s Attorney General, John Ashcroft, asked him to create a system to track foreign travelers. Sound familiar? Kobach then built on this database experience to create Crosscheck, which he has persuaded election directors in states across the country to adopt. 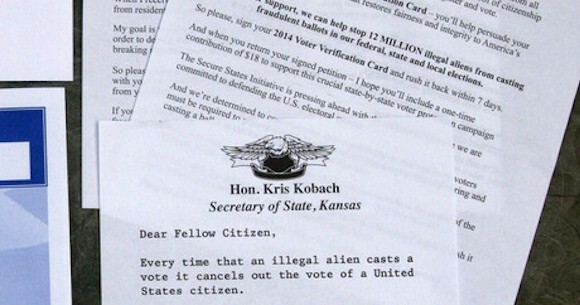 Kobach has long cited wildly inaccurate statistics to claim widespread voter fraud by immigrants, and has used these alarming figures to persuade state election officials to hand over their voter rolls to him. There is little or no evidence of Kobach’s claims of widespread voter fraud. Even in his own state of Kansas, where he was elected Secretary of State promising to crack down on immigrant voter fraud, he has only found nine cases of voter fraud out of 1.8 million registered voters. Nine voters out of 1.8 million. That’s two thousandths of one percent: the very definition of statistical insignificance. Using Crosscheck, 1.1 million voters have been purged from the rolls before the 2016 elections, overwhelmingly voters of color and the poor. Michigan has 16 Electoral Votes, Arizona has 16, and North Carolina has 15 for a total of 42 Electoral Votes. Trump officially won the Electoral Vote by 306 to 232. Switch 42 electoral votes from Trump’s column to Clinton’s, and she would have won the Electoral vote by 274 to 264. And that doesn’t even take into account that Trump officially won Wisconsin’s 10 electoral votes by 22,748 popular votes and Pennsylvania’s 20 Electoral Votes by 44,292 popular votes. In essence, Kobach and other Republican operatives used Crosscheck to wrongfully purge voter rolls of minority voters and grant the presidency to Donald Trump, without even accounting for other voter suppression techniques they used. With Kobach now leading Trump’s “Voter Integrity” Commission, Trump and the Republicans are gearing up to steal the 2018 and 2020 elections, unless activists stop them. Already, Crosscheck may have denied Democrat Jon Ostroff an outright victory last month in the Special Election for a House Seat in Georgia’s 6th District, forcing a run-off in June. Crosscheck focused on Korean-Americans in the suburban Atlanta district, like Sung Park, who was dinged for voting in two states because he has a name that is as common among Koreans as James Brown is among African-Americans. But mainstream Democrats, and liberal media like MSNBC, have largely ignored the Crosscheck story, and have instead focused on hot-button controversies like the impact of Putin and Comey on the 2016 vote. They do so at our peril. With the power of a Presidential Commission behind him, Kobach and his billionaire supporters like the Koch Brothers and Sheldon Adelson will likely purge millions more minority voters from the 2018 and 2020 voting rolls, setting up the grand theft of future elections and, if we look the other way, guaranteeing Republican control of our government into the indefinite future, regardless of the will of the people. It’s up to the resistance movement to stop them.